This entry was posted on Sunday, July 17th, 2011 at 22:05 and is filed under Sarah Palin. 1. My review was more than a type-written page in length. 2. Sarah Palin has been defeated in an election, so the film is named inappropriately. In the interests of the brevity these critics will certainly appreciate, I would point out that not everything worth saying can be said in typical lefty drone fashion, but their criticisms can be distilled to a singular emotional eruption: “I hate Sarah Palin, so shut up about the movie!” That is the earnest truth about their meaning. Having covered the more intellectually honest of their complaints, at least by inference, I think the other criticism deserves a little more attention. I’ll bear in mind that I’ve lost most of the critics of the film by now, and will be able to cover the remainder of them unobstructed by the caterwauling of those not accustomed to reviews composed of more than a single grunt. 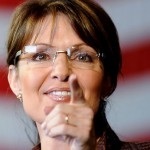 Therein lies the simple key to understanding the title of this excellent film: Despite everything the left wing juggernaut has done, despite all the attempts by Democrat operatives, and a few establishment Republican hacks too, Mrs. Palin remains as the Republican with the highest favorability among likely Republican voters nearly three years after the grand establishment jihad against her had commenced. This is another simple fact, but it requires a slightly more observant critic to recognize: Try as they have, with all their ridiculous bluster, and concocted and distorted stories about her and her family, there she stands, firm traditional values still in place, love of liberty unrepentant, sufficient courage still for any battle; unwavering, unapologetic, and yes, still undefeated. And I still stand with her. Followed the link about "the fix is in" here from "1,000,000 Strong for Sarah Palin" on facebook , stayed to read your post on "The Undefeated". Like you're page, I'll prob. be back. Thanks Abby! I hope you'll come back and spread the word to a few friends!